Hon. MP of Goa, Shri Narendra Sawaikar & Hon. 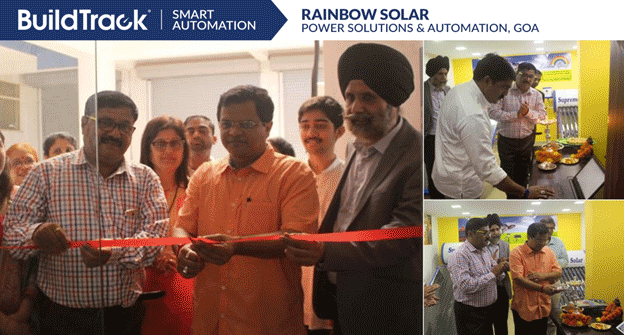 Minister for Town & Country Planning, Shri Vijay Serdesai recently inaugurated BuildTrack Channel Partner’s Rainbow Solar Power Solutions and Automations new office in Fatorda, Goa. The office was launched on 30th September 2017 in the presence of BuildTrack CEO, Mr. Balbir Singh Khera and Rainbow Group CEO, Mr. Dilip Nayak. About Rainbow Solar Power Solutions & Automations (http://rainbowgroup.in/rainbow-power-solutions/): Rainbow Solar Power Solutions & Automations are the Authorized Channel Partners for BuildTrack, a leader in Smart Automation and Internet of Things (IoT) solutions for Homes, Enterprises, Hotels, Hospitals, Senior Living, Warehouses and Energy Efficiency. Rainbow Group is involved in verticals like Engineering, Enterprises and Entertainment.